Here’s the latest sales report from Media Create (and Famitsu), covering Week 2, 2019 in Japan. Now that the holiday season is truly over, things have calmed down a fair bit in the Top 20 provided by Media Create. There’s a couple of new releases, and the biggest one is New Super Mario Bros. U Deluxe. It’s off to a great start, with 166 303 units sold at launch (3 days). In comparison, the original on Wii U sold about the same (over the course of 4 days), though it was without the New Super Luigi U expansion. So far, it’s safe to say that this Nintendo Switch version sold fairly well for a mere port, especially since it was actually one of the few games to sell decently on Wii U. It’s actually one of the worst debuts for a New Super Mario Bros. game, but comparing a port to brand-new entry doesn’t make much sense. 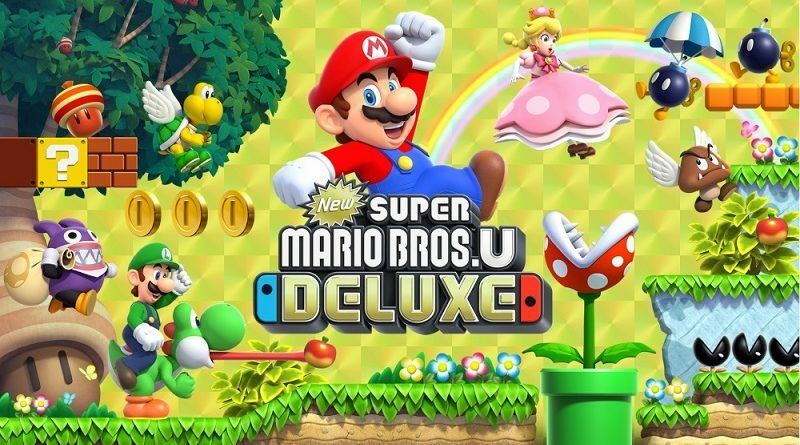 While there’s no doubt Nintendo is already satisfied by those sales, the real test will be the long-term sales: New Super Mario Bros. U Deluxe definitely has potential to sell well on the long run, the real question is how far sales will go. Will it follow the same sales trajectory as Mario Kart 8 Deluxe, or will sales slow down faster? The second entry this week is Tales of Vesperia: Definitive Edition, which ended up selling about 68 000 units on the two platforms it was released on. That’s a pretty decent number for a remaster, but unfortunately, it’s unlikely to sell on the long run (RPGs rarely do, especially remasters). The Nintendo Switch version sold 26 588 units, which is a solid number for a series that has mostly avoided Nintendo platforms in the past few generations (the last mainline entry was Tales of the Abyss 3D back in 2011, and it wasn’t even an original entry). If RPGs didn’t sell mostly during the first couple of weeks, then it might have had a shot at outselling the PlayStation 4 version. Still, no doubt Bandai-Namco is satisfied by the sales of this remaster on Nintendo Switch, especially worldwide, especially as in Japan, the game started facing supply constraints during the weekend. However, it’s not clear how big of an impact those shortages had on sales, and how widespread they were. Week 2 marks the end of the holiday season (technically, Week 1 does! ), and so every time, we see major drop in sales during that week. And that drop spares literally no game, not even hugely popular ones like Super Smash Bros. Ultimate. Sales dropped by 76%, and topped 62 580 units… still a pretty respectable number, which indicates healthy sales. The game is well on its way to 3 million units, but it’s going to take a couple of months before that milestone is reached. Dragon Quest Builders 2 sold about 37 000 units during its 4th week on the market, bringing total sales to nearly 400 000 units (about 397 000 units to be precise). 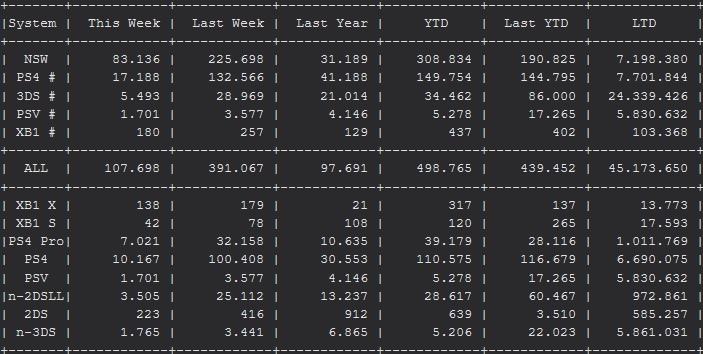 The Nintendo Switch version is outselling the PlayStation 4 version with 19 565 units sold, but the difference between the two versions isn’t all that significant (barely 2 000 units this week); it’s clearly in the long run that there will be a significant gap between the two versions. Looking at Super Mario Party, it’s pretty clear the party is truly over… for now at least. Sales dropped by 80% (19 054 units sold), which is no surprise for a party game outside the holiday season. That being said, it’s not truly the end for this game: it’s going to sell steadily through the year, with spikes during weeks with public holidays. So far, 955 194 units have been sold at retail, and no doubt the 1 million units milestone will be reached this very quarter (most likely in early February). As for Pokémon: Let’s Go, Pikachu! / Let’s Go, Eevee!, it’s certainly not spared by the drop in sales. 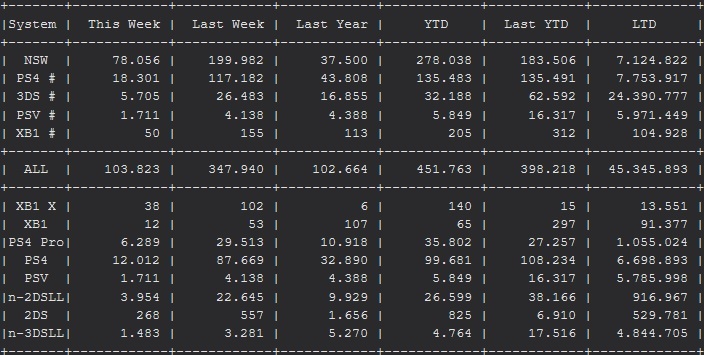 It sold 15 353 units this week (-78%), which brings total sales a bit closer to 1.5 million units (should be reached this quarter, unless sales drop too low in the upcoming weeks). Unfortunately, it doesn’t look like it will go much further than that if those Week 2 sales are anything to go by. Even the usual evergreen titles on Nintendo Switch felt the effects of the Week 2 drop: Mario Kart 8 Deluxe and Minecraft saw their sales drop by 73% and 71% respectively, with 14 991 units sold for the former and 12 590 units sold for the latter. Of course, they’re going to keep selling through the year and stay in the Top 20 from Media Create a long while, but for now, sales are down. Naturally, the Week 2 drop also impacted Hardware, though some consoles fared much better than others… or rather, just the Nintendo Switch, really. Its sales topped 78 000 units, which is fairly good for Week 2. In fact, it’s more than twice better than last year during the same week (about 37 000 units sold), due to the much stronger line-up of games available on the platform (like Super Smash Bros. Ultimate, which is going to do a lot of heavy lifting this quarter). With nearly 100 000 units more so far in 2019, the Nintendo Switch is doing pretty well compared to 2018. It’s not clear how well the console will fare in the upcoming weeks, but things are looking good so far. The line-up for Q1 is fairly solid, with many releases lined-up from late January onwards, but it’s definitely lacking in the blockbuster department (a game from Nintendo would have been pretty welcome). At the very least, sales should remain strong,: players are definitely getting lots of new content to enjoy on their console! As expected, Nintendo 3DS sales took a nosedive this week, and dropped below the 10 000 units/week threshold with 5 705 units. That being said, it’s not like they dropped like a rock: the handheld still has a little bit of life left in it, and it’s expected to sell in the thousands in the foreseeable future. But don’t expect big spikes in sales, even in weeks with public holidays. Click here for more Japanese sales data!